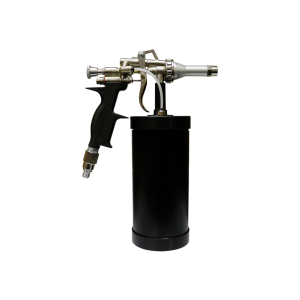 An easy to handle, low-pressure applicator that dispenses atomized particles of rustproofing. An all metal, one-quart canister is used to fog or spray almost any viscosity of coatings into the inner cavities of motor vehicles. Applies rustproofing through existing ports of the vehicle, eliminating the need to drill additional holes. Included in the system is a 36” superflex wand with a hooked brass, spray fan type tip. Kit comes complete with a gauge and regulator.